The Egan Research Center houses the Raytheon Ampitheatre and two smaller venues, conference rooms 340 and 440. June meeting of the NUSL Alumni/ae Association 2018-2019 Board of Directors. Meeting is not open to the public. Next year I suggest having the lights off in the presentation room. It would make everything look and feel cooler and we would be able to see the laser pointer better. I could not attend as there was no space for more students to get in. I really liked this event. I hope to go next year. Very interesting. Great discussion afterwards !!! Hope you will have more events on Jewish studies. Simply outstanding. As a Brazilian Fulbright Visiting Researcher and Physical Therapist in the Dep. 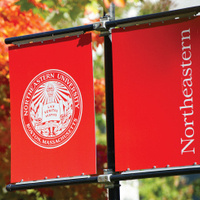 of Physical Therapy, Movement, and Rehabilitation Sciences, I could not have a better start at NEU. Congratulations and hope to have a possible chat with her about to some research in this area. Prof. Jefferson R. Cardoso, PT, PhD. The program worked well, but the pre-program advertising could have been better. everyone on the panel was great to listent to. their knowledge within their fields and how it relates to climate change was awesome.